Marriage records are some of the oldest records in Kentucky. Fortunately for genealogists, the various records created because of a new marriage can be filled with information. The Kentucky State Legislature gave the authority and jurisdiction of marriage in the Commonwealth to the County Court. 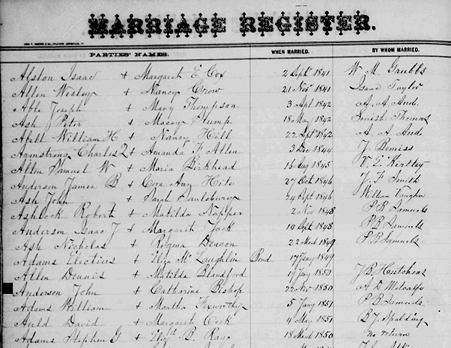 Marriage records were created by each respective Clerk's office in the counties. Marriage records in Kentucky began before statehood (1792) when this area and these early counties were part of the Colony (and later Commonwealth) of Virginia. 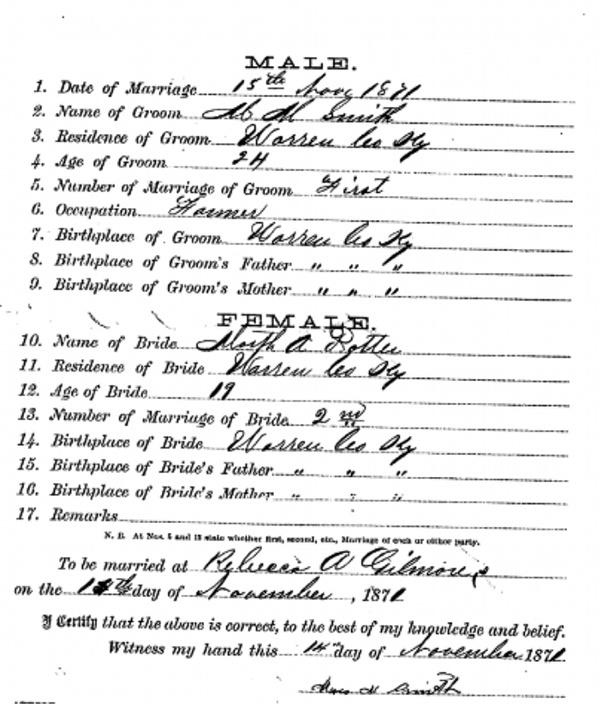 The list of Kentucky counties with marriage records beginning before statehood includes (with the year of their earliest extant marriages): Bourbon, 1786; Nelson, 1785; Jefferson 1780; Lincoln, 1780; Mason, 1789; Mercer, 1786; and Woodford, 1789. For marriages created in Fincastle or Kentucky County, Virginia, see Montgomery County, Virginia with marriage records beginning in 1773. 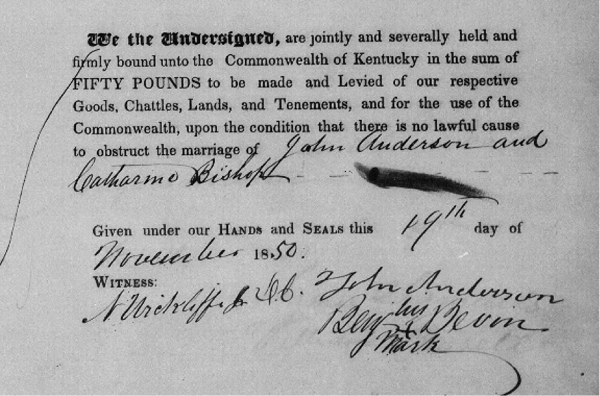 Marriage records found in repositories throughout Kentucky vary, but should follow a consistent pattern. Determining where a marriage record is located also means determining where it was created. Kentucky's county boundaries have changed over the years since statehood. The Newberry Library in Chicago has compiled these county changes into a wonderful site called the Atlas of Historical County Boundaries. This site displays the historical boundaries over the modern boundaries, in a format than can be printed or saved. Using this tool we can determine in which county the marriage occurred. There are times when we look for a marriage in the right physical location, but can't find the marriage we seek. Because Kentucky was served by traveling ministers or Circuit Riding preachers, we might need to consider a different strategy. Many Circuit Riders travelled long routes that covered multiple counties or states. Some of these ministers saved the marriages and recorded them all in a single location, usually their home county. What Records Might Be Included for Kentucky Marriages? 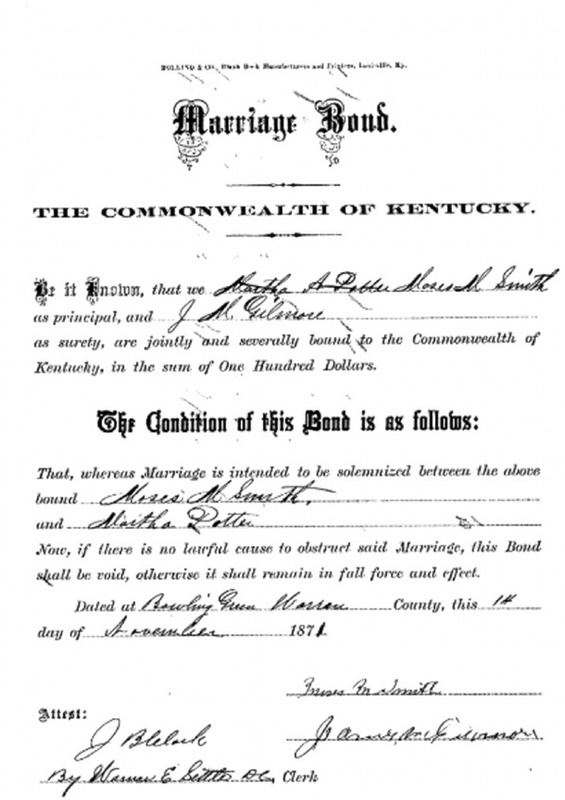 Kentucky Marriage Records often include bonds, license, certificates, and returns. There might be a combination where some of these records are in bound books, while others are loose papers. The license would be given to a Groom upon application and posting of the bond. The license would be given to the minister or Justice of the Peace (J.P.) who would add the solemnization information and return the license to the County Clerk. This information would be added in most counties to the bound Marriage Register, which would also serve the Clerk as the index to marriages. We should examine all available records when possible. The first step in obtaining a marriage license in Kentucky was to obtain a bond. The groom and his bondsman applied for a license including the marriage bond, usually in the County Clerk's office of the county of the bride's residence. The marriage bond protected the bride if the groom entered into the marriage, but was not eligible to create a valid marriage. For example, if the groom was already legally married, he would not be eligible to create the second marriage. The bride could file for damages in a local court and the bond would be invoked. The bondsman was usually a friend or relative, since this individual would be liable to pay the bond if the groom was unavailable. The bond amount was normally $100 and signed by the groom and bondsman, along with the representative of the Clerk's office. If the bride or groom was under the age of majority (first statute specified age 21 in 1798 Act) consent of the father or guardian was required before the Clerk. Marriage bond of Moses M. Smith, Marriage Bond Book A, Warren County, Kentucky. Sometimes parents' names, birthplaces, age of bride and groom, locations, number of marriage, and where the marriage is scheduled to occur. Not all bonds are available, and may be different for some years. For many of the earlier marriages, only loose bonds and paper exist. Below is the first record created in the marriage of John Anderson and Catharine Bishop of Nelson County. Note the bondsman for Anderson was Benj. Bevin and was obtained on 19 November 1850. Bond of John Anderson, Marriage Bond Book 1 (1846-1851), Nelson County, Kentucky. The license (shown below) was created and obtained on the same day as the bond. This indicates that Anderson had entered into bond and was granted this license to marry Catharine Bishop. You can see that on the 22 November 1850, Metcalfe officiated at the marriage. The 1850 census indicated Metcalfe was a minister. 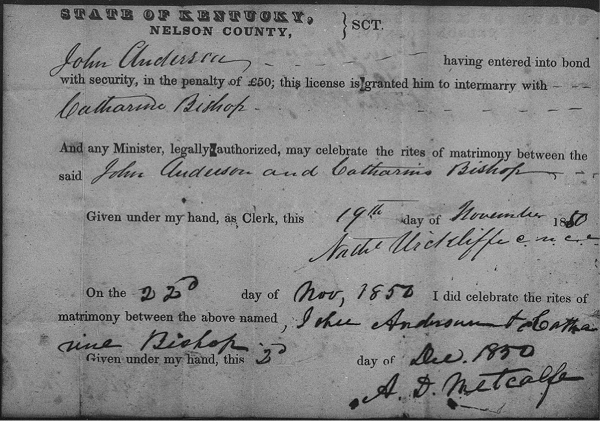 License of John Anderson, Original Marriage License, 1850, Nelson County, Kentucky. The 1798 Act regulating Solemnization of Marriage required ministers to produce their credentials and show they were currently associated with the group. They were also required to take an oath of allegiance, and enter into a bond (with two or more sufficient securities) of five hundred pounds, where the Court would grant a testimonial. A provision was made for Quakers and other Christian societies to solemnize their own marriages by the mutual consent of the parties, openly published and declare intent before their congregations when convened for religious worship. This marked section of the Marriage Register from Nelson County also contains the names of groom, John Anderson and his bride, Catherine Bishop, along with the date of their marriage (22 November 1850) and the officiate (A.D. Metcalfe). Marriage Register Book 1 (1785-1859), Nelson County, Kentucky. It is important to realize that some bound registers or books were created from the loose original records, and serve as an index. In some cases, the bound books became the contemporary record where signatures are recorded. It should be noted that marriage records in Kentucky were segregated by race in separate volumes for many years. If a record is missing from the "Black" or "Colored" marriage book, you should also check the "White" marriage book. The clerk may have entered the record incorrectly. Kentucky law required marriages occurring during slave times be recorded or registered. Many counties have these Freedmen's declarations within their records, and some with separate books. Check the FamilySearch catalog by county noting "Freedmen's Declarations" in the marriage listings. 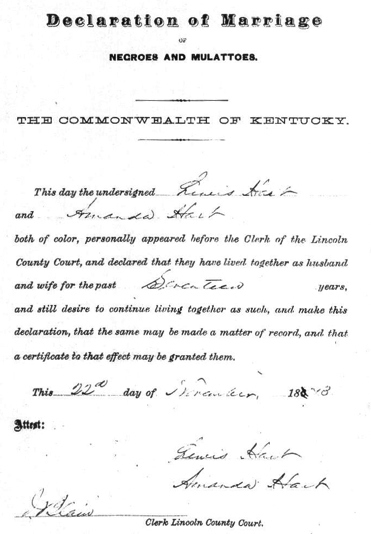 Declaration of Marriage by Lewis and Amanda Hart, 22 November 1872, Freedmen's Declaration Book 1, Lincoln County, Kentucky. Ancestry.com has other Freedmen's Bureau records, including Freedmen's Bureau Marriage Records, 1815-1866; Freedman's Bank Records, 1865-1871, which often indicates an depositor's spouse, parents and family; and Freedmen Bureau Records of Field Offices, 1863-1878, which contains a variety of record types. Always consider alternate source of marriage when the records are lost or can't be found. Among the best alternate sources to be considered in Kentucky are family Bible records, military pension applications, land transactions, will and estate records, census records, tax records, mortgages, newspapers and court records. Many counties of the KYGenWeb project have created online indexes of local marriage records. We should also consider a review of online newspapers in the area of our Kentucky research. The Kentuckiana Digital Library and Library of Congress' Chronicling America sites have many historic Kentucky newspapers available for research. Kentucky researchers are fortunate that marriage records are among the earliest records in a county. Be sure to look for all of various types of marriage records that might exist when researching your ancestors from the Bluegrass State. J. Mark Lowe, "Beginning to Search for Kentucky Ancestors."